The America Trucking Associations estimates the industry will need 890,000 new drivers over the next decade – an average of 89,000 per year – to replace the number of retirees and keep pace with growth. With no easement in sight for the driver shortage, except perhaps autonomous trucks, motor carriers may have to double down on technology to get the most of their capacity resources on hand. Routing and scheduling software systems have served this need for years, and now suppliers are seeing increasing demand for products that can take on pressures from more than just the driver shortage. Constraints on fleet capacity are also coming from electronic logging devices, rising diesel prices and the Amazon effect on delivery expectations. Businesses and consumers now expect to specify their own delivery time windows and do it using text or email, says Will Salter, president and chief executive of Paragon Software Systems, which develops route scheduling and execution applications. Routing and scheduling software can do more than maximize available capacity. It can assist in retaining drivers as well. This is one of the objectives for route planning at Transervice, an asset-based third-party logistics provider based in Lake Success, New York. Transervice uses routing software to offer drivers consistent schedules, says Thomas Poduch, the company’s senior director of logistic design and technology. To keep its schedules consistent, “we have absolutely adjusted some of the ways we look at routing” to get drivers home every other night and on weekends, he says, and maximize their earnings. Where possible, Poduch says the company sends drivers work assignments and routes a week in advance to set their expectations. This strategy is easier to do for orders from Transervice’s customers in the grocery industry because of more static and predictable routes. By contrast, its livestock business is not so predictable. Orders are ready when the product is ready and “no one is really sure when (products) are ready until they check,” he says. Another routing strategy is to “blow open” the route plans for customers on a quarterly basis, says Poduch. Transervice re-analyzes the routes by running “what if” scenarios with its TMW Final Mile routing software to understand the impact of different time windows for pickups and deliveries, for example. As capacity grows tighter due to the driver shortage, Poduch is seeing more customers take control and ownership over their own route planning and scheduling. 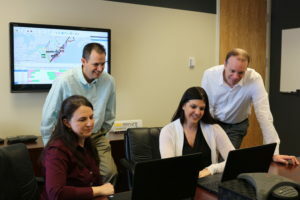 Shippers are taking route planning and scheduling in-house to optimize their network of inbound and outbound shipments. As a 3PL, Transervice typically manages one side of the ledger. The company has been sharing routing data with customers to improve the overall solution. The best-laid route plans may fall short if drivers do not have the right information and workflow processes at their fingertips. Paragon has a form-based mobile proof-of-delivery system called FleXipod that populates with routes and information about each stop. The app also gives drivers tools to send automated phone calls, text messages or emails to customers to update the status of the deliveries, Salter says. The automated customer communication tools can eliminate the need for drivers and for office staff to respond to customer queries for simple delivery updates. Once deliveries are completed, FleXipod can speed the completion of paperwork by electronically sending invoices, statuses, work orders, etc. to the main office for billing purposes. The customizable data forms record information such as signatures, photos and checkboxes. With delivery data transmitted in real-time, office staffs are alerted to job completions and can send out immediate invoices, Salter says. FleXipod also integrates with existing systems for invoicing and other processes. As driver shortages and other constraints make it difficult for transportation companies to grow capacity to keep up with demand, technologies like routing software are helping bridge that gap by fully utilizing and increasing the efficiency of existing resources.